A former Sinn Fein infrastructure minister has been slammed after it emerged he took a “neutral” stance over plans to build a highly contentious waste incinerator. The Department for Infrastructure has given the green light for the £240m facility on the outskirts of Belfast, despite it receiving over 4000 objections from residents. The move received universal condemnation from all the main political parties, including Sinn Fein – who have been vocal opponents of the project since it was first unveiled. However, it has emerged that one of the factors in the decision was that the department, then headed by Sinn Fein’s Chris Hazzard, took a “neutral” stance. 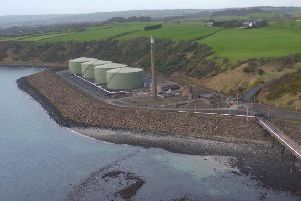 The plans had been rejected back in 2015 by Mark H Durkan during his tenure as infrastructure minister, with the SDLP MLA stating there was” no need” for the facility. However, the developer appealed the decision and won. The Planning Appeals Commission heard how circumstances had “moved on” since Mr Durkan’s decision and it was “no longer seeking to defend the stated reasons for refusal”. Mr Hazzard has been heavily criticised on social media, given his party’s seemingly contradictory messages on the matter. Defending his position of neutrality, the Sinn Fein MP said he was seeking to “protect the integrity of the process”. Mr Hazzard’s position on the matter emerged on Wednesday when the Planning Appeals Commission published its decision to approve the incinerator. In its findings, he was described as having been “neutral”. On the same day, Sinn Fein MLA Gerry Kelly issued a statement in which he branded the decision “a disgrace”. The party reiterated this position yesterday, with Declan Kearney MLA describing the move as “wrong and unjustified”. Responding to the criticism levelled against him on social media, Mr Hazzard said it was important that the final decision maker – ie the minister in charge – should “protect the integrity of process by remaining neutral until the point of decision”. Sinn Fein’s Gerry Kelly accused the SDLP of “playing politics” over the issue, adding: “For Mark H Durkan to attempt to exploit this controversy in order to score cheap political points is nauseating. “As a former minister himself he knows Chris Hazzard, as infrastructure minister, was duty-bound to remain neutral during the appeals process. “Mark H Durkan himself remained neutral during the initial application process for the incinerator and refused to take part in the debate in the Assembly on this issue at the time for this very reason. Mr Kelly claimed that, had Mr Hazzard adopted any other position, he could have “undermined the integrity of the entire process and been open to legal challenge”. “It is only when the appeals process is complete that a minister can make a final decision,” he added. But UUP MLA Steve Aiken branded Sinn Fein’s position “highly disingenuous”, accusing the party of “once again attempting to re-write inconvenient facts to suit their current position”. He added: “They are trying to make out that this is something Chris Hazzard had to do because of process. It is highly disingenuous. According to those behind the project, the massive facility on the Boghill Road in Mallusk would divert up to 250,000 tonnes of waste from landfill per year. This would be sorted into waste and recyclable material, before the unusable material is burned to create electricity. Developers arc21 also claim the plant will supply enough electricity to power over 30,000 homes, and create an estimate 340 permanent direct and indirect jobs. However, there has been major public opposition to the plans, with residents citing fears over traffic and impact on house prices. Meanwhile, an environmental group says it plans to mount a legal challenge against the controversial waste incinerator near Mallusk. Colin Buick, chairperson of protest group NoArc21, said: “We have fought against this project for many years and those living in the communities who will be affected by this fundamentally flawed proposal will be rightly disgusted at the decision. “We are also extremely concerned that the decision has been taken without a Minister in place given the fact that all political parties have supported our campaign. The group will be holding a public meeting at 8pm on Thursday, September 28 at Academy and Community Hub, Mallusk Road.